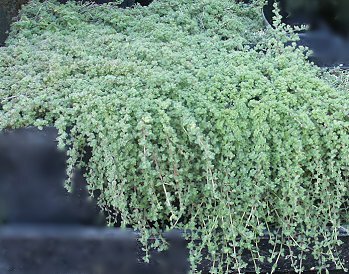 Soft and silvery, Woolly Thyme is in a class by itself. Tightly knit, it makes a great filler for in between pavers or along borders. It rarely flowers which makes it a good choice for those allergic to bees. It is the grayest of all the thymes and should not be confused with the prolific bloomer and greener Hall's Woolly Thyme. 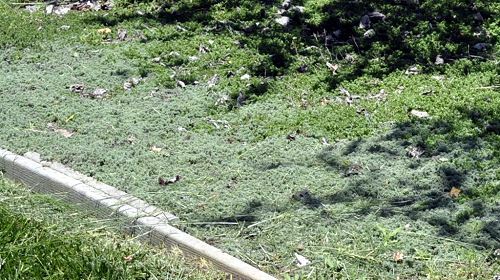 We have had some success with growing Woolly Thyme in partial shade in our hot summer climates. Drainage should be excellent and in our area watering regularly is a must. It grows slowly and can die out in patches if watering is not even. Here we see Woolly Thyme (next to the gray boards) densely covering the ground. The dark green thyme behind it is the fast growing Pink Lemonade Thyme. Three years later the Woolly Thyme was completely taken over by the Pink Lemonade Thyme. Woolly Thyme is really better for in between flagstones or in small patches. The other thymes we like to use in between stepping stones are Annie Hall Thyme, Elfin Thyme, Highland Cream Thyme, Leprechaun Thyme, Mint Thyme, Pink Chintz Thyme, and White Moss Thyme. 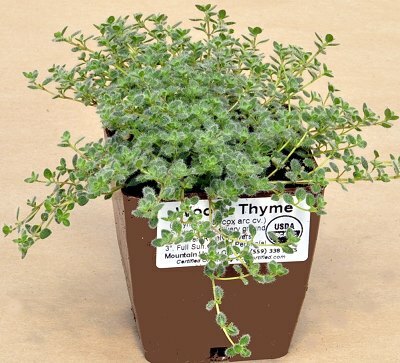 Woolly Thyme is often included in our economical Flagstone Filler Assortment. This plant is often available in plug trays. These trays hold 128 of all the same plant. They are a great low cost way to fill a lot of space. Each cell is 3/4 of inch by an inch. Check here to see if Woolly Thyme Plug Trays are available.